This is the a review from the youtuber Naturaljoy. Thanks so much for her professional feedback. "The unit I’m rocking today comes from Afsister. They are a new company. This is Vanessa bob and I have It in the length 12 inches, it is a medium cap size also an ombre unit. 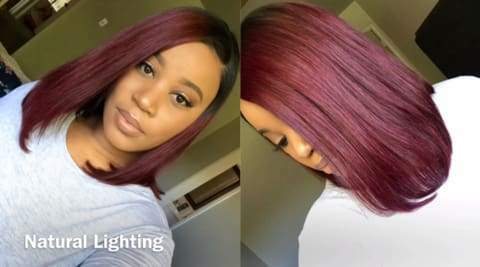 It does have a preplucked hairline and do have the dark brown lace and they offer two options so they offer the lace front option which is what I have and then they offer a glueless full lace wig. Also states that this unit is 180% density. This unit dose come with your soft lace and it comes two combs in the front a comb in the back in adjustable straps. The package of this unit was really pretty, and had a little bow over the box. I didn’t even want to take the bow off because I love the way that it was packaged. This unit came really quickly within three days after they shipped it. When I opened up the box, the unit smelled really good. It didn’t have any funky smells or anything. Also felt very thick before I wash it. I have this part on the side, because a lot of the times when I showing you guys bobs, I always have it parted in the middle, well I wanted to do a side part today. I did put a little bit of baby hair but like I said I don’t have glue down at all. The hairline looks really good. Washing this hair I didn’t experience any shedding or tangling but what I did experience was that this color did bleed while washing, when I conditioned the hair and let it sit for a little bit, when I rinse the conditioned out it didn’t as much as it did when I first put water on it. So I will just be aware of that and make sure you wash this unit really good. I love the length on this and they did a really good job as far as the cut goes. And it just really pretty even the color is down right. There is no patchy pieces, they did a good job. I do love the color because it comes on burgundy but in the sun you can see some hints of red. It’s just a perfect combination without doing too much. I think this would be perfect for the summer time. I really don’t have any complaints when it comes to this unit. I think it is beautiful. The cut on it is nice as you guys can see when I turn it around. I don’t have any comments besides the color did bleed a little bit which I think that it will stop over time." Afsister always stands behind our products and we are aimed to offer better service to the customers.